But first, a new makeover! An upcycled record cabinet. If I go a week or two without working on any furniture, it really gets me down. Transforming furniture is therapeutic for me; it’s definitely a stress reliever. Do you feel the same? 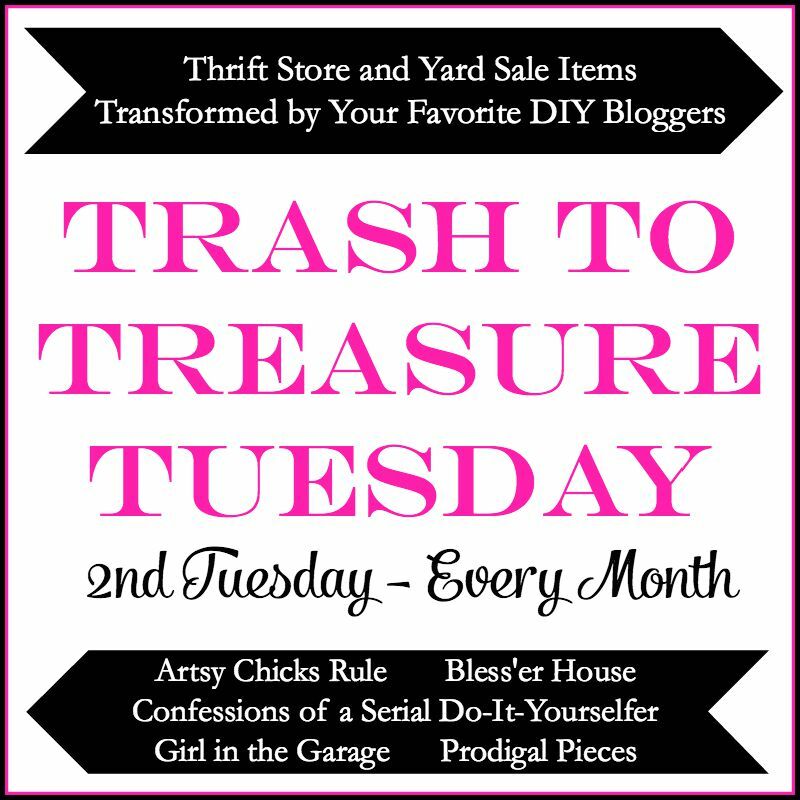 *Friends, today is Trash to Treasure Tuesday with a few of my creative blogging girlfriends. You can see what they’ve transformed this month at the end of this post – and you can browse our previous T2T makeovers Here. Also, this post contains some affiliate links so you can easily find some of the products I use and recommend. 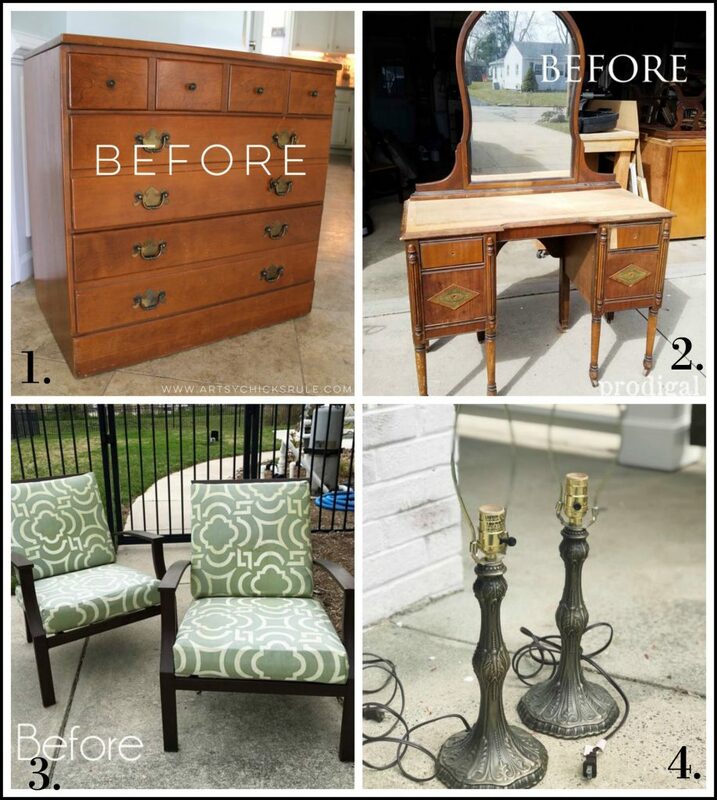 Unfortunately it was really scratched and beat up, but that’s how I like to do my makeovers – turning someone else’s “trash” into a treasure. 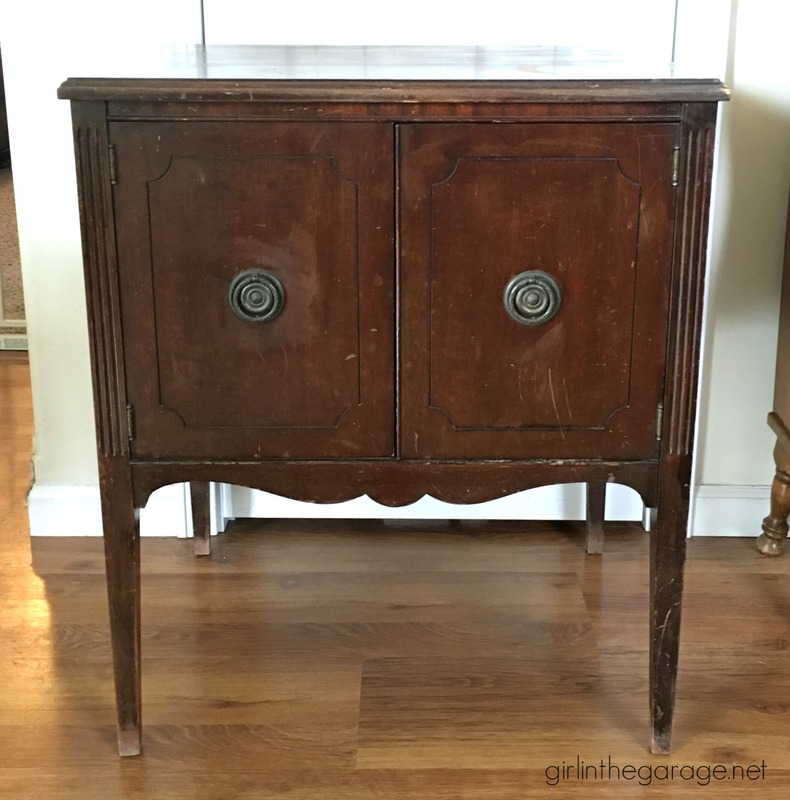 It’s hard to tell from the outside, but this was actually a vintage record cabinet. I was deciding what to do with this piece and got a wild idea – I grabbed the saw from my mitre box and cut all the dividers out. Now there’s so much more storage space inside. I filled the holes with Minwax Wood Filler and then sanded them smooth. Very easy. 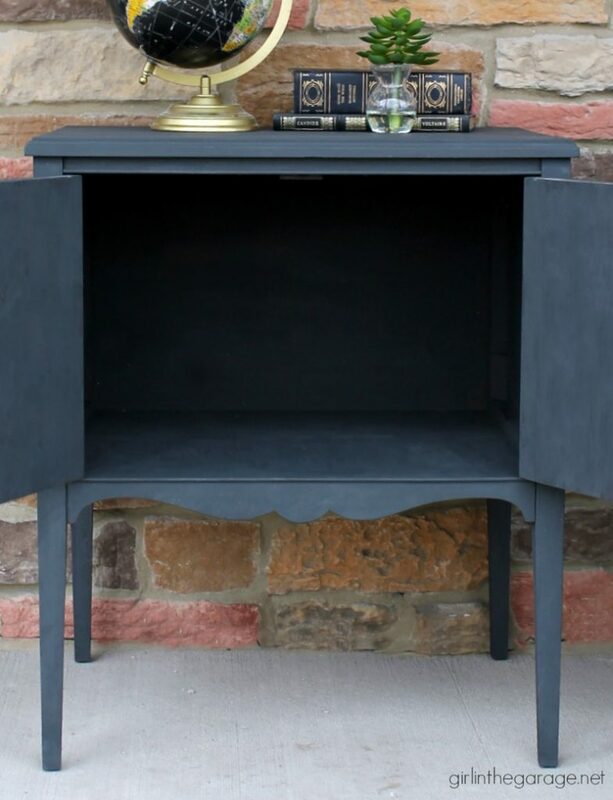 I painted the cabinet in Annie Sloan Chalk Paint in Graphite, measured the doors, and then Guy in the Garage cut rectangles out of thin craft wood from Menards. 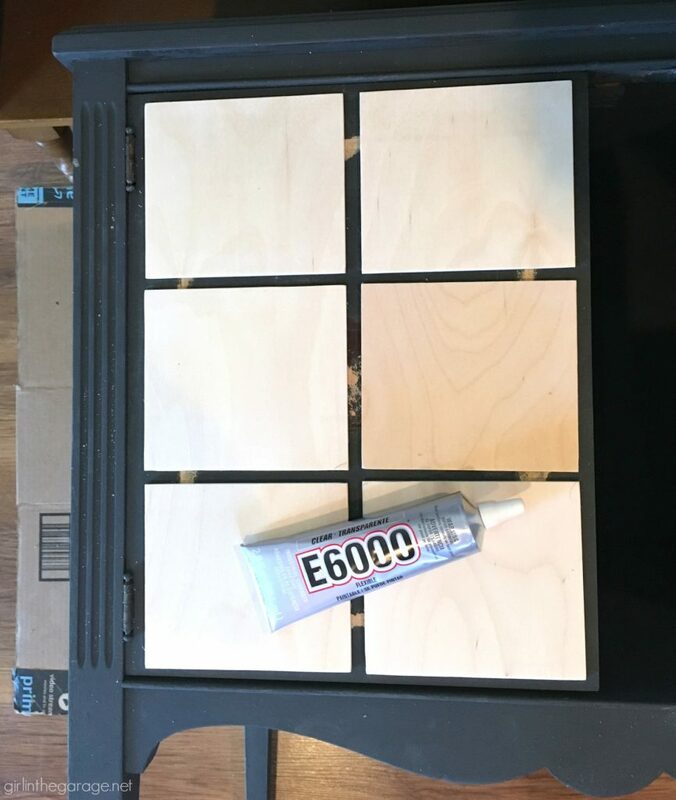 The panels were glued in place with my favorite industrial strength super glue which I use on all my faux DIY card catalog projects. 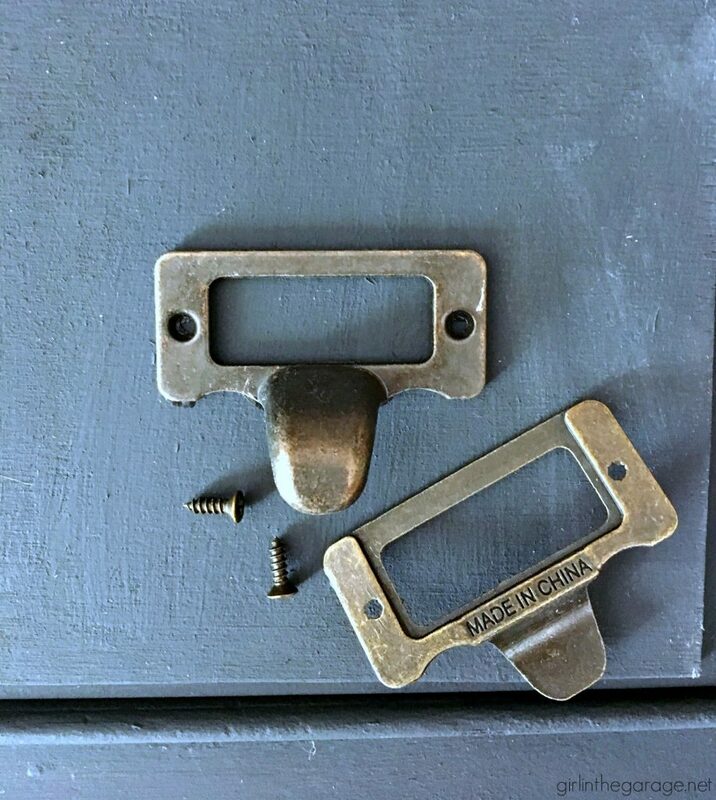 I always have card catalog drawer pulls on hand – these are from Amazon (find them here). Since the screws that came with them are tiny, I added a bit of glue first for extra adhesion. I don’t want anyone pulling to open a door and having the drawer pull fall right off! Finally, this upcycled record cabinet was protected with Annie Sloan’s clear wax. I just adore making faux card catalogs. Even if it doesn’t fool someone, it’s definitely a unique piece of furniture to have in your home. If you’re not familiar with the paint color Graphite, it’s a mix between dark gray and black – like a chalkboard. I’ve been doing a lot of white makeovers lately so it felt good to pull out this can and use it again, and it’s perfect for this piece. As always, I’d love it if you left me a comment with your thoughts or any other ideas for transforming a record cabinet like this. I’d also appreciate if you’d pin or share this project with a friend – thank you! 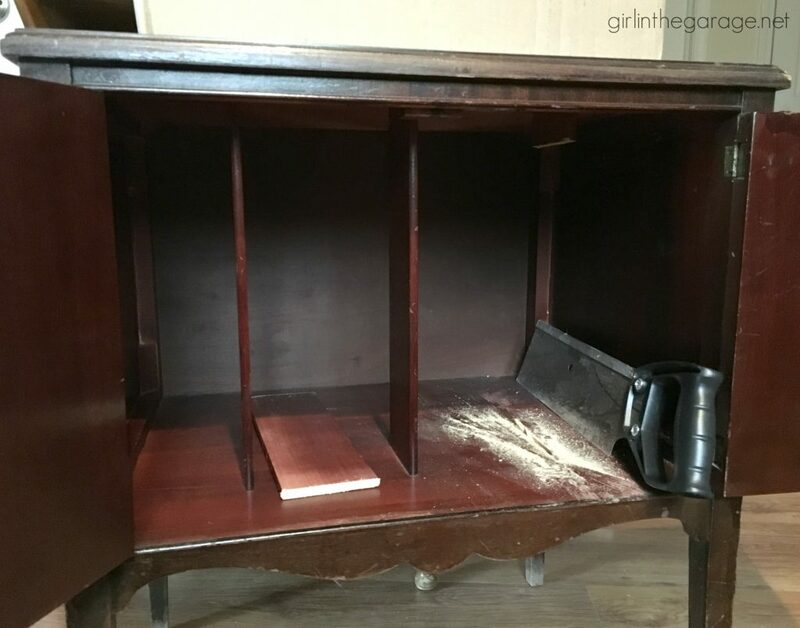 Below are the Before photos – visit the links underneath to see the After and learn how they did it. What a sweet save, Jen! I love the color and the updated fun look. So inventive. I have a half size of a record chest like urs. Thanks for the inspiration. Luv following ur page. Really cute and creative. I love AS graphite. It’s such a great color. Thinking of painting my front door that color. But back to the record cabinet update, I love your creativity. For me it would have been hard to get past giving up the great original pulls. Thanks for the inspiration! 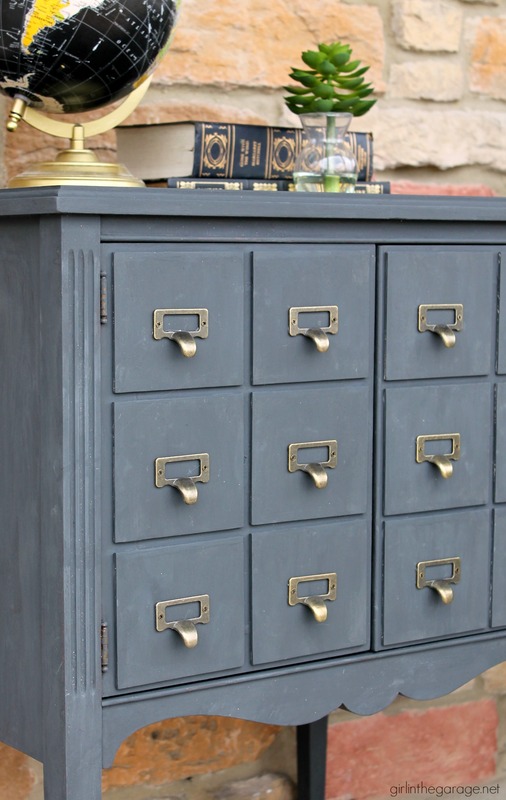 Love this as a card catalog! It’s gorgeous! Oh, that is so cool Jen! And I love the color! It really does look like a card catalog. I’d go up to it and try to pull the drawers open, no doubt! What a fun makeover, Jen. Really nice makeover! However, I dislike having things used as decorative touches that only look useful – fake dormers, drawers/drawer pulls, curtains on walls when there is not a window behind, etc. I would have used either the original hardware pulls or a new pair for the same area… would be just as stylish and more appropriate to the piece. SO good! I must do this. I love this. 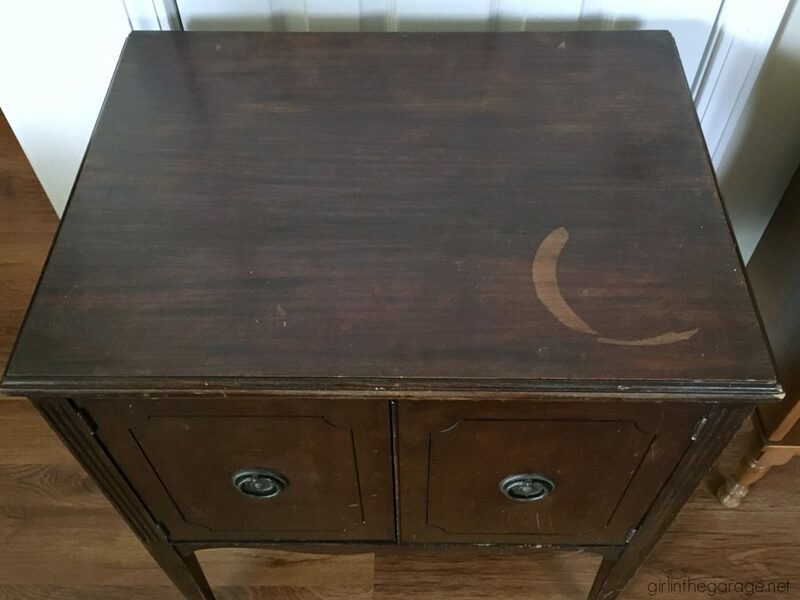 I picked up a cute little side table with a cabinet door at an estate sale last weekend and I think I’ll try this look. Love it! I’m a fan of card catalogs too so this really caught my attention. I appreciate that – thank you Carrie! What a great job! I so enjoy your posts and seeing your creativity! Kudos!!!! Wow what a great save. 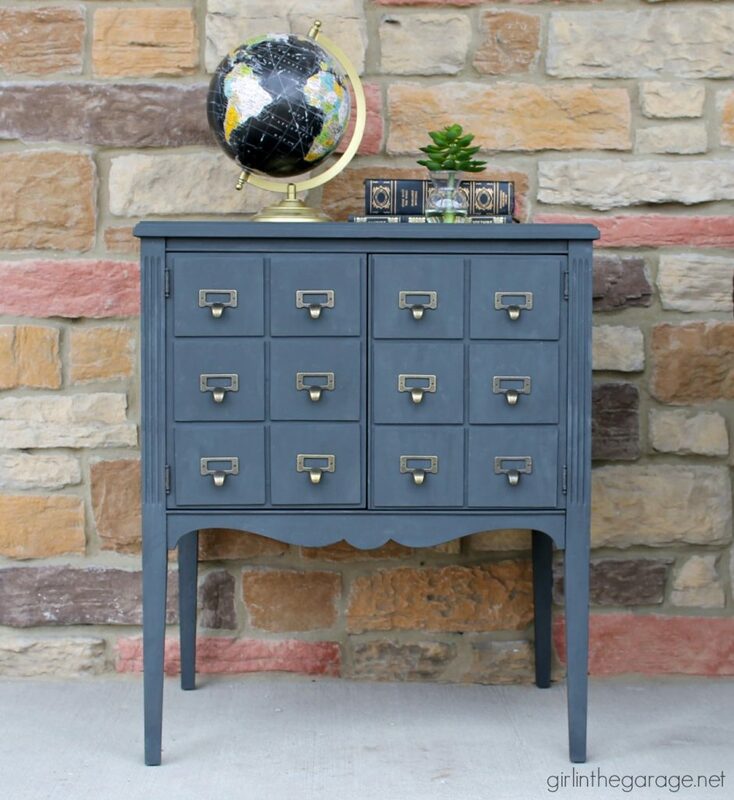 Love the color you used and it really looks like individual drawers. 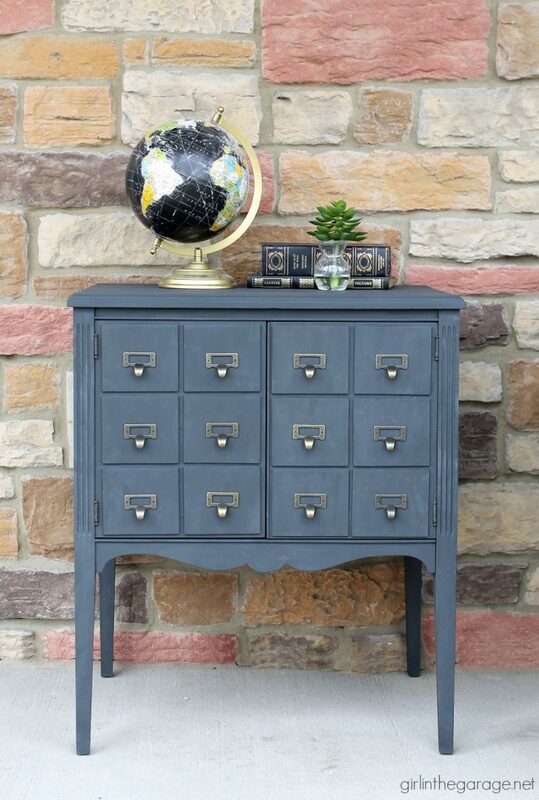 Love the look, I love card catalogs and the color is awesome! Jen, I just love how you made over this piece. You breathed new life into it. While you changed the original style you made it fun and colorful. Great job! Thanks for the inspiration. I refinished a similar record cabinet like yours in 2016. I didn’t have quite the imagination you had, though. 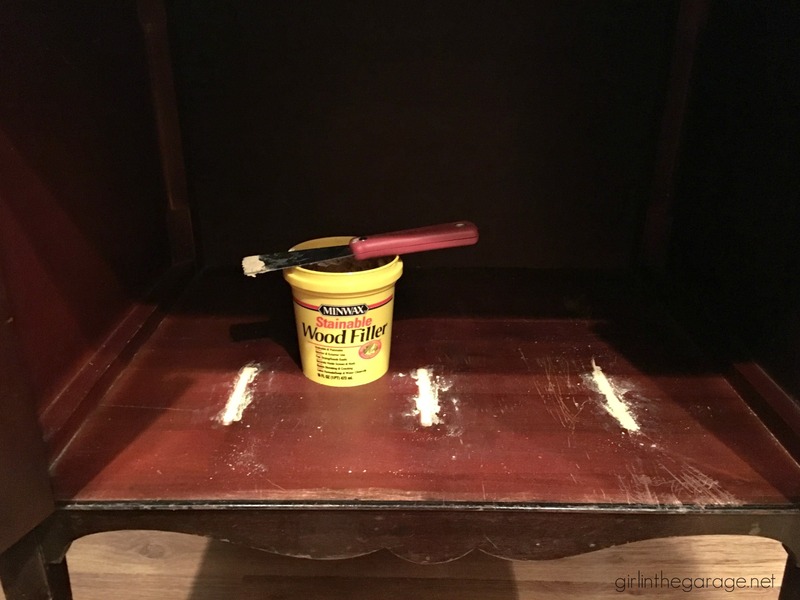 I painted the cabinet part white and stained the top. I put more contemporary door pulls on it and we use the table to store papers and magazines in, plus a lamp table between our two recliners. I love card catalogs, too, and you’ve done a great job imitating one! Haha, I laughed so hard at your comment! I do love card catalogs! 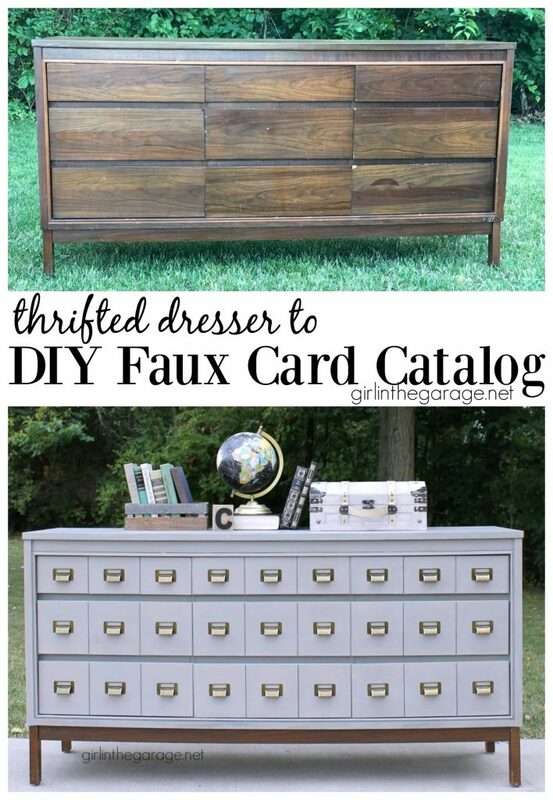 😉 And I just found a big wide dresser just like the one I turned into a faux card catalog last summer. Guess what I’ll be doing with it… Thanks for your comment Pam! I love how the cabinet turned out. The color is fabulous too. I’ll be Pinning this post for a little inspiration down the road. Thanks for sharing. Thank you Rhonda, I appreciate it! My fingers just couldn’t pin this any faster? You are a genius. Love everything about it. Jen, this is gorgeous. I love the color. You have given me an idea for a piece my daughter has. Thanks for the inspiration! Really cute! I’ll have this craft wood stuff. I can see a lot of applications for that. By the way yours is beautiful,was that wood filler you used ? I don’t always reply haveing health problems ? trying to perk up ?? Sweet! I never thought it would turn out so well, as I saw the pieces your hubby had cut to glue on the front! Y’all are an impressive team! One of the nicest transformation I’ve ever seen. Beautiful job! 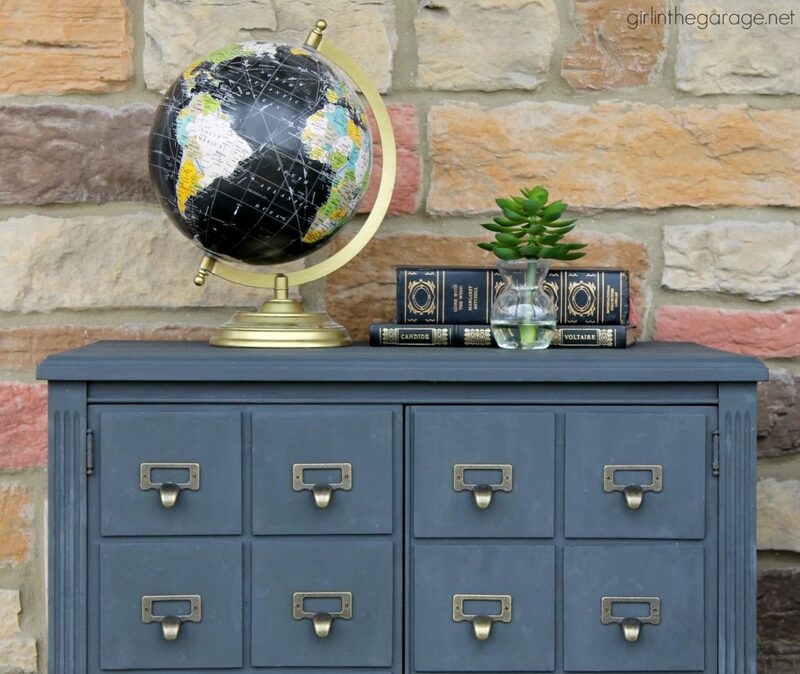 Thanks for sharing this Jen and all the details such as the card catalogue pulls. 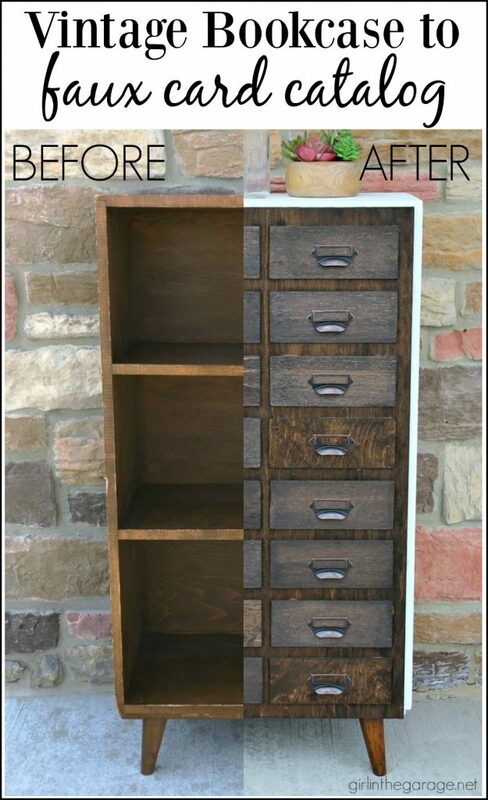 I love what you have done with this cabinet. so, i’m looking back at this one from the link on today’s post (1/24/19) and am wondering about the doors. the before doors appear to have some raised woodwork and i’m wondering if you just laid the square pieces of plywood on top of that, cause to me they would not have stayed level toward the center. or did you removed that trim work? i love the finished product AND the color! So they were grooves! Now that makes plenty of sense! Thanks for the reply!